The premier convention and entertainment centre is located in Auckland, New Zealand. Image courtesy of SKYCITY. Levels one, three and five will be dedicated for the core exhibition, meeting and event spaces. Image courtesy of SKYCITY. The $471m project has been designed by a collaboration of Warren and Mahoney, Woods Bagot, and Moller Architects. Image courtesy of SKYCITY. The New Zealand International Convention Centre is a premier convention and entertainment centre being built in Auckland, New Zealand. A design team led by Warren and Mahoney and comprising Woods Bagot and Moller Architects is responsible for creating the world-class facility. 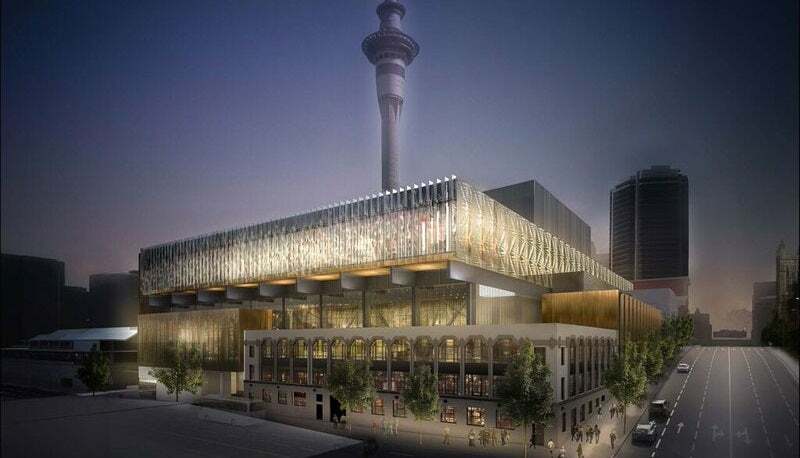 Proposed to be Auckland’s landmark and iconic building, the convention centre will play host to major international conferences, while catering for 2,850 delegates. "Proposed to be Auckland’s landmark and iconic building, the convention centre will play host to major international conferences, while catering for 2,850 delegates." Located at the southern end of the site fronting Hobson, Nelson and Wellesley Streets, the centre will occupy the southern half of a full block in Auckland’s central business district (CBD). The project is being developed by New Zealand’s biggest entertainment provider, Skycity, in agreement with the New Zealand government, at an estimated cost of $471m. It is part of a wider development, which includes a 300-room hotel, 1,300 car parks, and an accompanying laneway. The total investment on the development is estimated to be $700m. Construction on the proposed centre began on 16 December 2015 and is expected to be completed over a period of 38 months in 2018. Upon completion, the centre is estimated to generate approximately 1,000 jobs across various sectors such as conventions, hospitality, retail, food and beverage, and gaming. The centre’s design reflects the character of the country and people, the shared qualities of an open and dynamic culture, and a dramatic relationship to the landscape, while embracing deep textures and innovative technologies. A terracotta-clad spine wall will mark the gallery and main entries and will also define the edge of the public laneway. Design of the centre includes a 100m gallery space for navigating between the events and the building. The building has been designed with minimal internal pillars to prevent obstruction of the delegates’ views. The ceilings in the exhibition hall will be 9m-high. The walls have been designed to be flexible with adjustable height to provide multi-functional spaces. The design will include transparent major spaces and floor-to-ceiling glazing, which will allow natural light inside the building. The unique glazing will also allow the visitors to have a visual experience of the city life, while encouraging people viewing the facility from outside to visit and explore the centre. With a gross area of 32,000m², the convention centre is expected to be five times bigger than the current biggest convention facilities in New Zealand and will have 24 meeting rooms. Entrance for the primary building will be from Hobston street, while alternate entrances will be from Nelson and Wellesley streets. Vehicular entrance and exit will be from the same location as the existing Skycity car park entrance, which is currently off Nelson Street. Proposal for a secondary exit onto the Hobson street has also been planned. The facility will have a total of five floors wherein levels one, three and five will be dedicated for core exhibition, meeting and event spaces. Levels two and four will be smaller, intermediate floors compared to the former three levels. At level three, the main 8,100m² exhibition space will be constructed along with flexible meeting rooms. Gallery facing the Wellesley street and the main entry gallery will also be accommodated on this level. Level five, which will be the top level, will offer a panoramic view of Auckland and Waitemata harbour to the visitors. The 2,850-person plenary meeting and reception area alongside the sunset room, a banquet and function space for up to 840 people will also be constructed on this level. A public atrium, an external laneway and a dedicated multi-use plenary theatre, all suspended above 8,100m² of flexible ground floor exhibition and support spaces, will be a part of the facility. Fletcher Building is the construction partner for the project,while Boffa Miskel is the urban designer and landscape architect.